This beautiful herb is all around our lovely garden. I just have to talk about this beautiful flower and share my love for it. The colour so vibrant the blue can truly be this magnificent or a gently pink. The flowers are so sweet but very mild in flavour. If you have Borage in your garden and have never tasted it, well now is a good time to try. Borage does hold other uses in the vegetable garden and is a treasure to have around. It's vibrant blue attracks bees to the garden it is a great companion plant for both strawberries and tomatoes. It is said to improve the flavor of both. 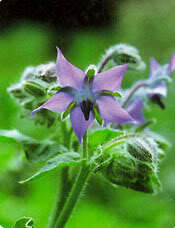 As a remedy borage has a relaxing effect generally and is said to dispel grief and sadness, is great for the heart. 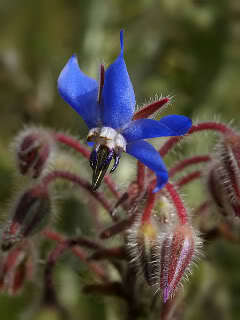 As a flower essence borage is agian the remedy for courage and optimism. Like the cordial herb, it is excellent as a heart remedy to relive the heavy heart-ed, ease the broken heart-ed, and brighten the disheartened. Also, yes there is more the children love to eat them!!!! "The only reason for making a buzzing-noise that I know of is because you're a bee...The only reason for being a bee that I know of is making honey....and the only reason for making honey is so I can eat it. " I will tell you everything about the bee process is so cool. The queen bee in her little box which has to have a sugar plug that the worker bees will eat away of a few days so the queen bee gets use to her new hive. These bees sure love their Queen Bee. All this preparing for the bees are very cool. Looking at approx. 1500 bees swarming around the box at one time is a sight to see it is so cool. The smoker is used to calm the bees when you are working with them. It sorts of mimics a forest fire so the bees go to their Queen to protect her and they lay low. I am a little partial to the cute little smoker that is helping out on the farm this particular day. I am not always involved with the bee process though I would love to it is a time thing and there is soo much going on in the garden at the moment but it is sure cool when I get the chance. From what I hear they are doing great and many new eggs are being layed and another hive was just added to the top. I can see a lot of activity going on over there. I know I keep saying it but this is cool. one day I would like to bee a bee charmer. Ahhhhhh, finally getting out in the garden after the winter is wonderful. Tilling in some lovely manure from the lovely horses on the farm. Preparing the garden beds for all the future veggies and flowers, blissful. We decided to get out a plan (hopefully) do our best to sort of stick with it. With our plan we do companion planting putting veggies together that like to hang out and putting in flowers here and there that help with ucky bugs and attract the good bugs. We are expanding our herb garden this year which is very exciting, getting in some potatoes and with the help of many sweet lil' hands from the farm class creating a kids sensory garden. So much excitement for sure. Though, I am slightly put off from all this SNOW we are getting this April into May. I remind myself how wonderful this moisture is. The worms oh how we love worms in the garden. Seeing the start of those sweet lil' sprouts brings so much excitement for what is ahead. Such wonderful times planning, digging, starting to plant and watching sprouts start to emerge from the soil. HI I am Angela. If I am gardening I am blissed-out. I am blessed to be able to garden at Laughing Buck Farm and be part of this amazing place and family!